Weak characters can help you win. Why shouldn't their GP be included in the calculation/algorithm? Weak characters didn't "help" you win. You won because you have the dominant fleet. I had weak characters to put on my defense, so that I could save all my strong and mediocre characters for offense to make sure, that I would be able to clear my opponent's board. I was at a quite large disadvantage in characters, remember?! So yes, they helped me. I do applaud you for winning under the quite large disadvantage. I actually believe, that I had the advantage, because of my strong fleet. Even though my opponent ranked 20 in fleet arena, his ships were significantly weaker than mine, giving me the advantage. However, there shouldn't be a disadvantage. No one should have an advantage over someone else. It should be a relatively fair matchup and whoever set the best defense and played the best offense wins. I disagree. I believe, that even matchups are not fair for those, who have the stronger roster (same GP - less 'fluff'). Why should players with weaker rosters have an equal chance of winning prizes for rank 1 as the ones with stronger rosters? With even match-ups, players with much stronger rosters (still same GP) will end up at 0/3 victories, while players with far weaker rosters will end up with 3/3 and better prizes. I don't see how that is fair. Even and fair are two different things. At least that's what many of us want and I would assume the devs intended this game mode to be. "THE ULTIMATE TEST OF SKILL". But we have yet to even receive the smallest of responses from anyone official whether or not GA should be fair or if people should have advantages and disadvantages. We don't have anything official, but I believe it's safe to assume that it's intended that players with weaker rosters are mixed with players with stronger rosters (same GP). You say it again even after its been answered. Most of us talking about fluff. Joined before tw or GA existed. We built for TB not knowing TW was coming. We were coached by holotable hero in game mails to build GP (fluff) for better results in TB. I should not be punished for joining the game at least a year before you. Trash arguments. Most of you are trying to penalise players like me who have worked on my roster properly. I don’t want to face players double my gp. I do that in the arena.... if i did i’d want tripple the reward for double the fall, back to the casino, the table wouldn’t let me face the person with £1million because i only have £100. It’s straight forward answer if you don’t like the GA, don’t play it, if you don’t like losing then (SHOCK) don’t play it. It’s a fun installment to the game and most of you are crying about it. ITS FAIR END OF. Who defined "properly"? Who decided what the "proper" roster is? If CG says "A lean top heavy roster is what you all should do" then okay. (Odds of them responding are less than 3,720/1). But over the years they've remarked how they've wanted to incentivize players to expand their rosters. That's where our disconnect is as a community. And why this argument still exists. Where is the test of skill for the guys who are breezeing through. This isn't testing skill. It is allowed a mismatch with blessings and handing hard sought rewards and items to a select group. It is game discrimination. And it isn't being fixed or curtailed, but allowed. What if...they changed how GP is calculated? I doubt you bothered to read the topic throughly and consider the ideas presented. There is no discrimination.... This is a resource management game, if you fluffed your roster rather than focusing on good toons, you did it to yourself.... Don't expect the game to reward you for that.. This is why so many of these posts exists. No one can agree on how GA should be implemented and what is right. I wouldn't hold my breath for CG to reveal the details of their algorithm. Post the screen shots. Otherwise my **** claim stands. Result of GA. From avatars and titles you see my 3 total wins and my opponent's 2 wins. 1.) The amount of times that will work you can count on 1 hand. That was the 4th time that strategy won me the battle. At least it's the 4th time I applied against an opponent with significantly weaker ships than I and significantly more g12 characters. I see your defense was wiped in 1 shot each. Same as if you hadnt set a defense except for that fleet. My opponent probably also got bonus points for unuseds slots. Still, setting defense also scores points. It's required to win. Well, fluff had the exact same type of effect on match-making in TW as it does now in GA. It's not a new phenomenon. Further you won because of your ships not with your weakntoon defense placement. So you were corrdct saying you won. Butnitnwasnt BECAUSE you placed weak toons it just was while you posted weak toons and a strong fleet. I won because I saved all (ALL) my strong and mediocre characters for offense to make sure, that I would clear all zones - no matter how many attempts it would have taken, and no matter which counter was required. That's kind of the same as winning because I set a weak defense. What if you have all the good characters and fluff? I still haven't seen any answer that justifies, that players with weakly built rosters should have an advantage over players with strongly built rosters, by giving them easier opponents. You're assumptions are wrong. This alt is on a march '16 shard (but yes, it was cryogenized for 14 months shortly after creation). I hit level 85 with that account a few months before TB was introduced. Nevertheless, the scenario is exactly the same as for older accounts with 4 million GP. Some accounts are fluffed up, while others aren't. Some have significantly more g12 characters than others. Why should players with weaker rosters have easier access to win a GA? You are not punished. Nothing is taken away from you. Players with stronger rosters than you (same GP) simply have easier access to rank 1 prizes than you. Why should it be any different? You're assumptions are wrong. This alt is on a march '16 shard (but yes, it was cryogenized for 14 months shortly after creation). I hit level 85 with that account months before TB was introduced. Your argument is just silly...so you created an alt account to shed GP in favor of only having o.p. toons. And now you deserve to be given access to premium prizes because you no longer have to fight for them. This is basically what your saying am I right. That is so laughable..but that is exactly what CG is doing and you made the point so clear with that statement as to why the current matchmaking is wrong...Thank you! Now if you would fix this we would all appreciate it CG! You are incorrect..my matches as stated have been 1 sided heavy in favor of Zata count and g12 toons. Stop with your lean and fluffy rooster retic..admit you are being favored in GA because your top 70 toons and only the GP from those toons are up against my entire roster GP which happens to be the same. Why are you so against a balanced challenge and in favor of unbalanced matches. What is it you fear. I know you fear what half of us have faced for 4 months and your matchmaking won't make you have that feel good feeling anymore. We understand all too well. Read all of the post...has every one of your matchs in GA been so 1 sided. I'm talking 28-30 zatas vs 44-51 zatas...30g12 toons vs 50-60 g12 toons...that's what I'm talking about. Why should I have too face such hard opponents..let me use your argument. You don't fear it than request CG make changes so as that you get quality fair matches as well. Stop belittle others who's roosters in no way match up too yours. You are currently advocateing for no change...Demand better..or continue to be selfish. Choose! Let me ask you, what is your overall GP? 3.8m...yes I have been playing for awhile...the roster..was misspelled...good catch. And yes I have been inflating it by chasing meta toons recently..and I was playing long before TW....TB...and GA. But untill about ahead ago joined a guild to complete raids. So not alot of g12 toons with zatas. Yes I'm at the extreme end of the spectrum. Thanks for asking. Arena is absolutely fair in the way that you are grouped with players that started at the same time as you. 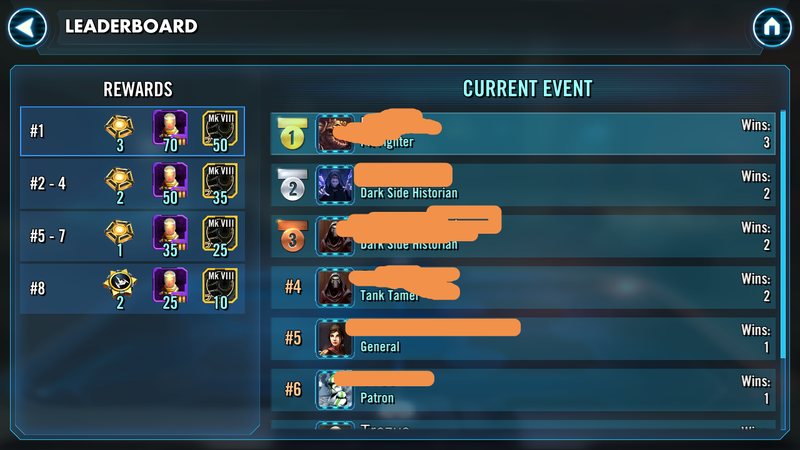 CG obviously desires fairness, otherwise there wouldn't be any sort of matchmaking paradigm. There is. And we are debating the accuracy of it. Fair point, but I would suggest that using GP is fair.... GP is a measure of the resources you have invested into your roster..... .
Is it though? We discussed this in length. I claim it's absolutely neither a fair measurement of the resources used or the efficacy of the outcome. If it was you would be able to explain how a 10K GP toon is almost complete junk and doesn't compare in anyway to a 20K one. 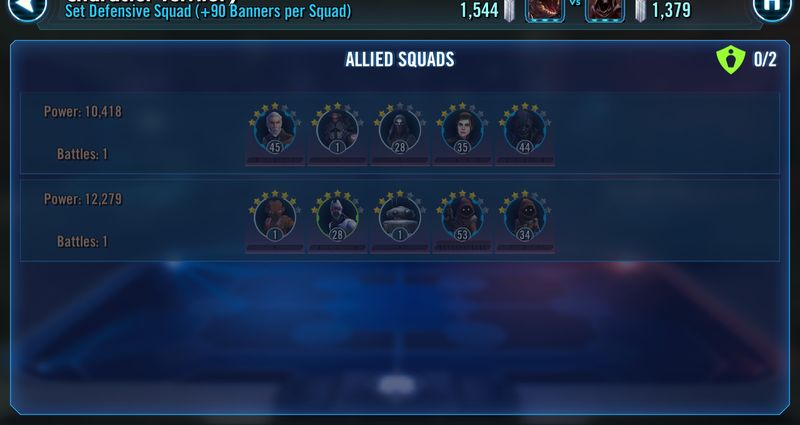 The cost of the resources sinked in a 20K toon(G12) is approx. 6x the amount sinked in a 10K one (G8). That's one of the disrapencies. Correct, except that the "resources" I have used on "fluff" have not affected my gearing up of the "good" characters. I'm behind on high level gear, G11 and G12 stuff. I have all the good characters, however many of them aren't as strong as others because I am not at the same point in high level gear acquisition as some of my opponents. However my "fluff" boosts me up to a level comparable to theirs ONLY based on Level, Ability Level, and Stars of under performing characters that I have acquired with the EXCESS resources I have, just because GP is our measuring stick. I have never wasted a single stun gun on someone like CUP. You must understand that. GP does NOT measure "Resource Management". That's literally all it is. No more, no less. Our problem is resources used on characters that won't matter are being calculation into the equation, like Ship GP in 3v3 matches. My only desire is for GP to be made a good representative of either the cost of the resources used or the efficacy of the outcomes (or a blend of these two). Currently it's nowhere close. And if we just go by the result, I won all my matches so far besides 1 (with an opponent that has 2x good mods as mine) despite being at disadvantage several times with approx 1.3M worth of fluff. I should say I enjoy the challenge. So it's not my personal grump that keeps me bringing me back to these topics, but my sense of fairness and my claim on being able to locate the problem/solution.